WASHINGTON - A U.S. commando's curt message to superiors signaled the end had come for the world's most wanted terrorist: "Geronimo EKIA," meaning enemy killed in action. Osama bin Laden, the al Qaeda leader who liked to pose with a menacing AK-47 assault rifle in his hand or by his side, was discovered without a gun by the Navy SEALs who barged into his room and shot him dead. The White House on Tuesday gave a more complete picture of the assault  and corrected some key details from earlier official accounts  as the team that pulled off the storied raid in Pakistan briefed officials and rested back at Andrews Air Force Base outside Washington. The administration possesses graphic images of bin Laden's corpse, at least one of which is likely to be released, according to CIA Director Leon Panetta. Officials hope that doing so would quiet any doubts that bin Laden is indeed dead. The worry is that anti-U.S. sentiment would be inflamed as a result. CBS News national security correspondent David Martin has also had the photos described to him and said it "does sound very gruesome." Bin Laden was shot twice at close range, once in the chest and once in the head, right above his left eye and that bullet opened hi skull, exposing his brain and it also blew out his eye. So these are not going to be pictures for the squeamish," Martin said. How did bin Laden resist Navy SEALs without a weapon? Rep. Peter King, R-N.Y., among the lawmakers who had the images described to them, played down the concern of inflaming anti-U.S. anger. "They're not going to scare people off," he said. "Nothing more than you'd expect with a person with a bullet in his head." Codenamed Geronimo after the Apache fighter of the late 1800s who was ultimately captured by the U.S., bin Laden was buried at sea from an American ship scant hours after his death. White House officials initially suggested bin Laden had been holding a gun and perhaps firing at U.S. forces. The corrected account raised questions about whether the Americans ever planned to take him alive, or simply were out to kill him. Panetta told "PBS NewsHour" that bin Laden "made some threatening moves" that "represented a clear threat to our guys" but was not more specific about what the unarmed terrorist did as the commandos engaged others at the compound in a firefight and burst into their prey's room. "I don't think he had a lot of time to say anything," Panetta said. "It was a firefight going up that compound. ... This was all split-second action on the part of the SEALs." Panetta underscored that Mr. Obama had given permission to kill the terrorist leader: "The authority here was to kill bin Laden," he said. "And obviously, under the rules of engagement, if he had in fact thrown up his hands, surrendered and didn't appear to be representing any kind of threat, then they were to capture him. But they had full authority to kill him." After they shot him in the head and chest, the SEAL team in just minutes quickly swept bin Laden's compound for useful intelligence, making off with a cache of computer equipment and documents. The CIA was hurriedly setting up a task force to review the material from the highest level of al Qaeda's leadership. The documents provide a rare opportunity for U.S. intelligence. When a midlevel terrorist is captured, his bosses know exactly what information might be compromised and can change plans. When the boss is taken, everything might be compromised but nobody knows for sure. The revised account of bin Laden's final moments was one of many official details that have changed since he was killed in the nighttime raid early Monday morning in the Pakistani city of Abbottabad. The White House misidentified which of bin Laden's sons was killed  it was Khalid, not Hamza. Officials incorrectly said bin Laden's wife died in gunfire while serving as his human shield. That actually was the wife of a bin Laden aide, and she was just caught in crossfire, the White House said Tuesday. 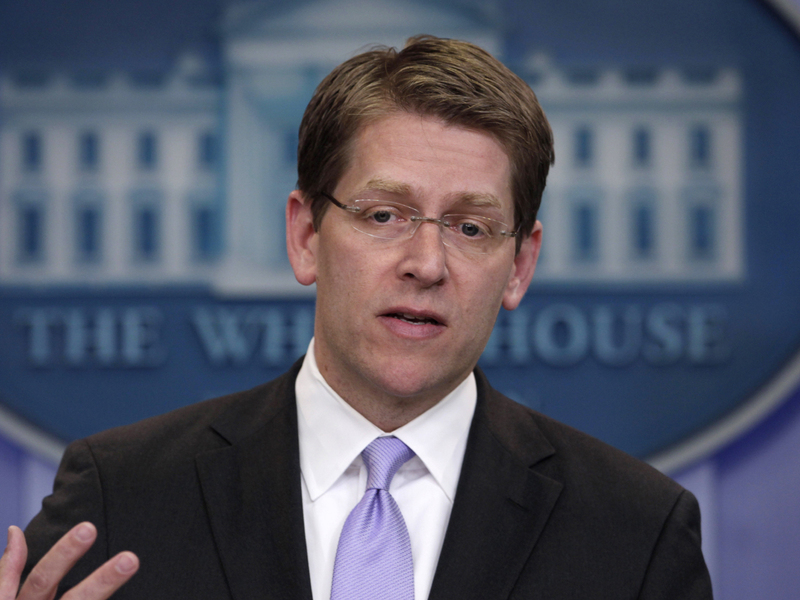 White House Press Secretary Jay Carney attributed those discrepancies to the fog of war, saying the information was coming in bit by bit and was still being reviewed. Nevertheless, the contradictory statements may raise suspicions about the White House's version of events, given that no independent account from another source is likely to emerge. The only non-U.S. witnesses to survive the raid are in Pakistani custody. Five people were killed in the raid, officials said: bin Laden; his son; his most trusted courier, Abu Ahmed al-Kuwaiti; and al-Kuwaiti's wife and brother. The latest White House account leaves open the question of whether there was any gunfire from bin Laden's defenders in his room before the commandos shot him. President Barack Obama prepared to visit New York City's ground zero on Thursday to mark the end to one of history's most intense manhunts and to remember anew the victims of the Sept. 11, 2001, terrorist attacks at the hands of bin Laden's al Qaeda organization. In Washington, questions flew about whether Pakistan was complicit in protecting the mastermind of those attacks. Several Republicans and Democrats in Congress have raised the possibility of cutting off U.S. aid to Pakistan. The Pakistani government has denied suggestions that its security forces knew anything about bin Laden's hideout or failed to spot suspicious signs in a city with a heavy military presence. In a closed-door briefing for lawmakers Tuesday, Panetta said, "Pakistan was involved or incompetent," a U.S. official said, speaking on condition of anonymity to discuss the private meeting. Pakistan criticized the American raid in its sovereign territory as "unauthorized unilateral action." While tensions grew, efforts also were apparent to contain the damage in an important if checkered relationship. The Obama administration pushed back against the talk of punishing Pakistan. So did Republican House Speaker John Boehner, who said, "Having a robust partnership with Pakistan is critical to breaking the back of al Qaeda and the rest of them." And Sen. John Kerry, D-Mass., chairman of the Senate Foreign Relations Committee, said that despite difficult relations with Pakistan, "They have allowed us to pursue our drone program. We've taken out over 16 of the top 20 al Qaeda leaders because of that. That's cooperation." For the long-term legacy of the most successful counterterrorism operation in U.S. history, the fact that bin Laden was unarmed is unlikely to matter much to the Americans he declared war against. President George W. Bush famously said he wanted bin Laden "dead or alive," and the CIA's top counterterrorism official once promised to bring bin Laden's head back on a stake. Yet just 24 hours before the White House acknowledged that bin Laden had been unarmed, Mr. Obama's chief counterterrorism adviser, John Brennan, said, "If we had the opportunity to take bin Laden alive, if he didn't present any threat, the individuals involved were able and prepared to do that." Will it matter around the world? Some may try to make much of it in Pakistan and elsewhere. "This country has gone through a lot of trauma in terms of violence, and whether or not he was armed is not going to make a difference to people who were happy to see the back of him," said Mosharraf Zaidi, a political analyst and columnist in Pakistan. Yet, he said, "The majority have a mistrust of America, and this will reinforce their mistrust of America." Mr. Obama and his national security team followed the operation as it unfolded, watching television monitors, the air thick with tension at the White House. But Panetta said on PBS that the president and others gathered at the White House did not actually witness bin Laden being killed. Nerves were raw when one of the two Black Hawk helicopters that descended into the bin Laden compound Monday fell heavily to the ground. Officials believe that was due to higher-than-expected air temperature that interfered with the chopper's ability to hover  an aeronautical condition known as "hot and high." The SEALs all got out of the downed helicopter and proceeded into the compound. As they swept through the property, they handcuffed those they encountered with plastic zip ties and pressed on in pursuit of their target. Many SEAL team members carry helmet-mounted cameras, but the video beamed back to Washington did not show the fateful showdown with bin Laden, officials said. That word came from the SEALs on the ground: "Geronimo EKIA." The CIA's makeshift command center erupted in applause as the SEALs helicoptered to safety.